(07-31-2018, 04:12 PM)Ofnuts Wrote: Wait a minute, you are using Gimp in a virtual box? What is the host system? 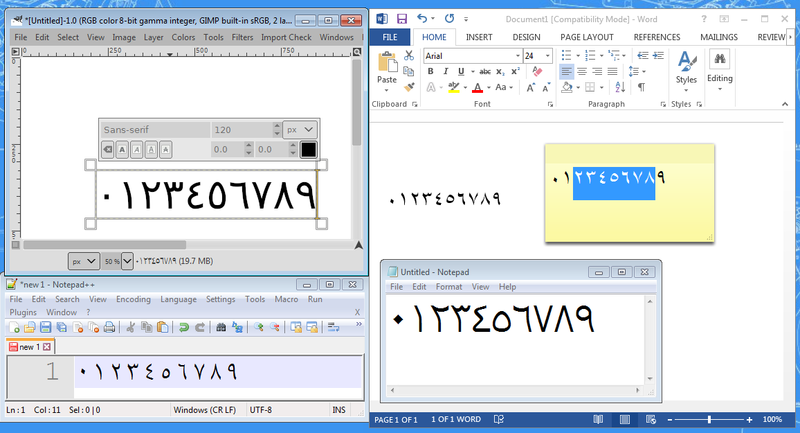 Are you able to enter Arabic numerals in other applications in the irtualBox (such as Notepad or Wordpad)? I have my machine which is windows 8.1 X64 with Gimp Installed which i have the thread case , and for ensuring that the issue is from windows i installed The Virtual Box Scenario. Both Give Same Result, the Only Way is Through The Character MAP. Answering Your Question No . i Can Write Arabic Numerals Only In MS Word. As it support This Feature Internally. i tried to write in notepad , same issue like GIMP. So the problem is with Windows... Are you able to copy/paste the Arabic numerals from Word to Gimp? (08-01-2018, 12:39 PM)Ofnuts Wrote: So the problem is with Windows... Are you able to copy/paste the Arabic numerals from Word to Gimp? When i copy the Arabic numerals from MS word and paste it to Gimp Text box its automatically converted to English Numerals. !!!! No Am Not Using Clipboard Manager. I will Investigate More and see if i can found where is the Error Outside Gimp. I did what you Do By Coping / Paste The (٠١٢٣٤٥٦٧٨٩) From https://en.wikipedia.org/wiki/Eastern_Arabic_numerals . It Works In Notepad / Notepad++ / GIMP. The Arabic numerals cannot be copied or past or either written in other program than the MS Word. What you can do as follow to get same situation . 1- Install Windows 8.1 With Arabic Language Support. / Arabic Keyboard ( So Multi Language Support (English USA / Arabic Jordan ). 2- Change The Typing language to Arabic ( Arabic Keyboard ). 3- Try to Typing Character it should type Arabic literals. 4- Try to Type Numbers ( here is the problem)...! (08-03-2018, 04:23 PM)crazyfrogjo Wrote: Dear Ofnuts. Thanks for your support and follow up. it was amazing . i will dig deep till touch the issue source as i think the issue related to extending the Arabic language Support to other application using MS Windows System Specially In Numerals As The Arabic Alphabets literals Work Perfectly Direct. The Issue only in Numbering Numerals.